The Cognitive Defender offers handgun classes for women only, and each class is tailored for smaller groups so everyone can get the individual attention they need. Each class will help you gain the skills you need to become a self-protector. Concealed Carry & Home Defense Fundamentals, Legal Elements of Self-Defense, Refuse To Be A Victim®, and Countering the Mass Shooter Threat -- are co-ed. If you are interested in a class, please email us and we will contact you within 48 hours. If a class doesn't fit into your schedule, private instruction is another option. Email carol@thecognitivedefender.com. We want to get you started on the right path. 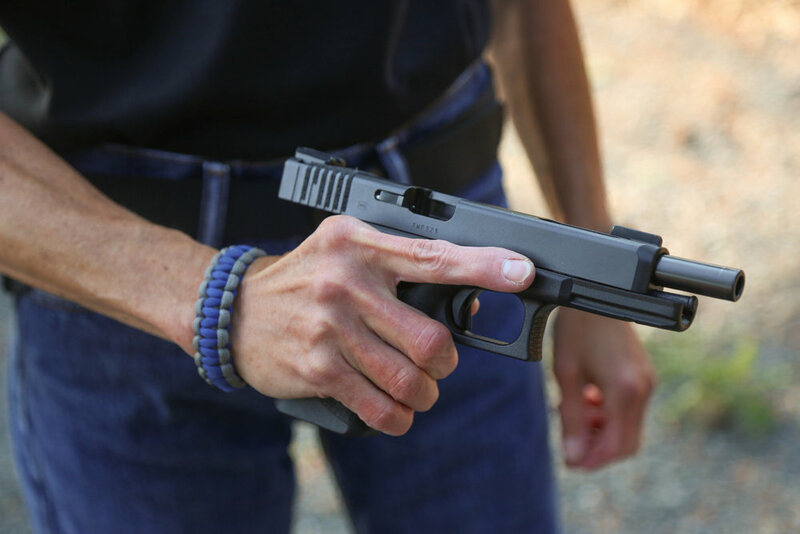 This class teaches three distinct levels (in two-hour segments): Women's Basic Pistol, Women's Intermediate Pistol, and Women's Defensive Pistol. It is designed to reach students who are brand new to firearms (and maybe have never picked up a gun before) through those who are ready to learn more about defensive shooting and take the next step with their firearm skills, tools, and mindset. The fundamentals of shooting will be introduced, reviewed, and built upon. Specifically, this course is all about sharing the basics – along with the fun, the seriousness, and the importance of being a responsibly armed female. After all, we are worth protecting. This class, developed by the USCCA, is a premium concealed carry and home defense class that exceeds the Oregon and Utah Concealed Carry Permit training requirements. You’ll walk away with an understanding of conflict avoidance and situational awareness; the physiology of violent encounters; the legal aspects of using deadly force (including knowing what to do in the aftermath); and why it’s important to have a legal and financial backup plan if you are ever forced to defend yourself. Owning or carrying a firearm is about taking personal responsibility for our safety and the safety of our families, and recognizing that we are our first responder. It’s time to take that responsibility seriously. Would reducing magazine capacity or banning AR-15s work? What are universal background checks, and would they end mass shootings? What about no-fly lists and terror watch lists? If gunshots rang out in a crowd, what would you do? Uncover this comprehensive blueprint for surviving a mass shooting. Whether you are parents, teachers, a committee from your house of worship, or local business leaders, this course will help to save lives by not only educating you on the real facts about mass shooters (including what factors truly affect the outcome), but by also providing dozens of concrete steps that should be taken, to truly counter this threat. This course analyzes data gathered from 48 mass shootings that have occurred since Columbine to determine what can be learned from these tragedies, and how following a comprehensive plan can help you to not only avoid becoming a victim, but also eliminate the presence of these shooters once and for all. This class is the NRA's award-winning crime prevention and personal safety course. It is designed to offer you a variety of options from which you can choose to prepare your own crime prevention and personal safety strategy. Experts agree the most important factor in surviving a criminal attack is to have an overall strategy before you need it. This class provides a comprehensive overview of actions you can take to minimize your chances of being victimized. Giving you confidence to defend others, and account for the strict limits on defending property. Explaining what "Stand Your Ground," the "Castle Doctrine," and "Presumptions of Reasonableness" REALLY mean...and what they DO NOT mean. You won the physical fight. You protected yourself and your loved ones. Now arm yourself for the legal battle that happens after an attack. Learn the five elements you must prove to raise a self-defense claim; what to say to the 911 dispatcher, responding officers, and investigative officers; and how you can help your attorney create a compelling narrative of innocence. Ignorance of the law is not a defense. Prepare yourself to protect your life and your freedom. If you have a group who wants in-house training, we will be happy to work with you outside our scheduled class dates. Also, with a group we can work with cost. If a handgun class doesn't fit in your schedule, private instruction is always an option. Let us know how we can help.